A young man named Patrick is hospitalized with a coma shortly after killing his mother and her lover via electrocution. While in the hospital, local doctors have exhausted all testing procedures to help him regain consciousness and the only hope now is undocumented attempts at electroshock therapy. Patrick’s new nurse Kathy is determined that Patrick’s condition can be cured and seeks assistance outside of the hospital. As Kathy tries to help Patrick, Patrick develops a love his new nurse and will stop at nothing to be with her forever. This means using his psychokinetic powers to seal their fate. This was part two in my Australian Horror Movie marathon. The story directed by Richard Franklin and written by Everett De Roche takes the viewer on a sci-fi type adventure through the eyes and mind of a troubled killer. The most shocking element to this Aussie movie is the production value is good for a film created in the late 70’s. Even though I wouldn’t categorize this as a horror movie, I still appreciate the fact that the story line is fast paced and kept me interested in the outcome. This movie will garner a few laughs and head scratching moments but in the end doesn’t really have any re-play factor. This film did however win countless awards its overall presentation was average at best. 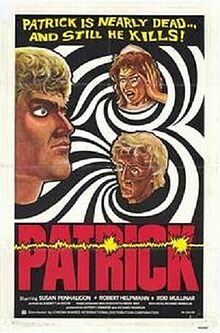 Besides cheering for some of the main characters to die - Patrick’s psychokinetic powers failed to deliver.